After leaking and then retracting information about its new phone twice in four days, Palm released a written announcement for the Treo Pro this morning which has remained on its Web site for several hours now. As anticipated from all the hype circulating over the past week, Palm's latest phone differs from the consumer-oriented Centro by targeting the enterprise. Capabilities intended to support that objective range from a Windows Mobile 6.1 operating environment to high-speed UMTS/HSPDA network functionality. Based on information officially made available today, the Treo Pro won't necessarily come cheap, depending on where customers are located. But it will support Microsoft Direct Push Technology, for direct connection to Exchange 2003 SP2 or 2007, along with Microsoft System Center Mobile Device Manager. Besides a thinner form factor and a large display, the phone also features integrated GPS, a full QWERTY keyboard, an international power charger, a 3.55mm stereo headset, a microUSB cable, and smaller niceties such as a one-touch Wi-Fi button and dedicated e-mail and calendar buttons, according to the announcement finally released this morning by Palm. Palm still hasn't explained either the information leaks of the past week or the rollout of the phone one day later than generally anticipated. But the company has now announced that the US version of the phone, due out this fall, will be unlocked and unsubsidized, and that it will be sold through the Palm online store as well as some Internet-based, retail and enterprise resellers for a suggested retail price of $549. 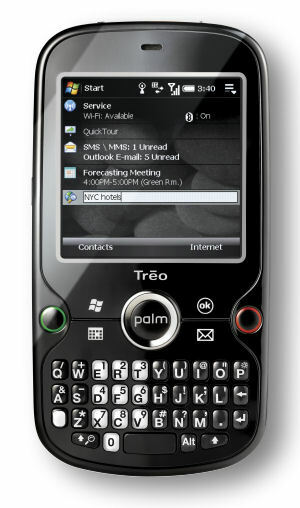 In Europe, on the other hand, the Treo Pro is slated for September availability through Vodafone and O2. Likewise, September availability is planned in Australia, where Telstra will sell the phone. Pricing options with a Vodafone contract, for instance, will run the gamut from free to EUR 399.